Lately, I've been interested in pulling up some classical modes of generating randomness. That is, rather than relying on a computer to generate my random numbers for me, which is all to common and easy these days, I wanted to go offline, and generate random numbers the classical way- coin flips, dice rolls, card shuffling, roulette wheels, bingo ball cages, paper shredding, etc. In fact, if randomness interests you, I recently secured the r/RNG subreddit, where we discuss everything from random number generators, to hashing functions, to quantum mechanics and chaos to randomness extraction. I invite you to hang out with us. Anyway, I was a bit bothered that all I could get out of a single coin toss was 2 outcomes- heads or tails. It seems like there just is no way around it. It's the most basic randomness mechanic, yet it seems so limiting. Then I came across 18th century mathematician Gearges-Louis Leclerc, Comte de Buffon, where he played a common game of placing bets on tossing a coin onto a tiled floor, and whether or not the coin landed squarely in the tile without crossing any edges, or if the coin did actually cross a tile edge. 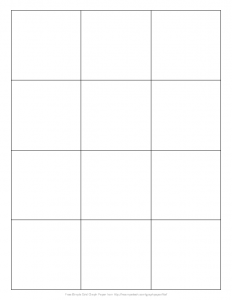 Then it hit me- I can extract more entropy out of a coin toss by printing a grid on a piece of paper. So, I put this up on Github as a simple specification. So far, I have papers you can print that are letter, ledger, a3, or a4 sizes, and coins for United States, Canada, and the European Union. Assume a tile has a length of "l" and is square, and assume a coin has a diameter "d" such that "d < l". In other words, the tile is larger than the coin, and there is a place on the tile where the coin can sit without crossing any edges of the tile. This means that if the edge of the coin is tangent to the edge of the tile, then we can draw a smaller square with the center of the coin, inside our tile. This smaller square tells us that if the center of the coin lands anywhere inside of that smaller square, the edges of the coin will not cross the edges of the tile. 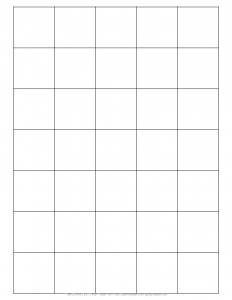 Now we know the coin diameter, but we would like to know the tile edge length, so we can draw our grid on a paper to toss the coin to. As such, we need to know the ratio of the area of the tile to the area of the smaller inner square drawn by the coin. I use "P" for our variable as this the probability of where the center of the coin lands. We want our outcomes equally likely, so we want the center of the coin to land with 50% probability inside the inner square and 50% probability outside of the inner square. Tails, crosses any edge(s) = 01. Heads, does not cross an edge = 10. Heads, crosses any edge(s) = 11. 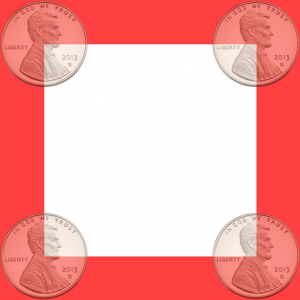 If we do a visual check, whenever the coin center lands in the white square of the following image, the edges of the coin will not cross the edge of the square. However, if the coin center lands in the red area, then the edge of the coin will cross an edge or edges. You can measure the ratios of the area of the red to that of the white to convince yourself they're equal, although careful- my image editor didn't allow me to calculate sub-pixel measurements when building this image. Remarkably, rather than treat the grid as a single dimensional object (does it cross any grid edge or not), I can use the grid an an X/Y plane, and treat crossing an x-axis edge differently than crossing a y-axis edge. However, that only gives me 6 outcomes, and it is possible that the coin will land in a corner, crossing both the x-axis and y-axis simultaneously. So, I need to treat that separately. Does not cross an edge. Crosses an x-axis edge only. Crosses a y-axis edge only. Crosses both the x-axis and y-axis edges (corner). Simple. 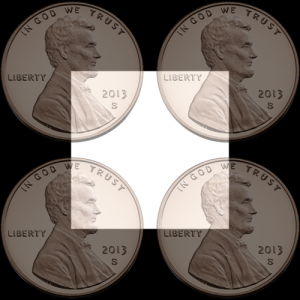 The length of the grid edge must by twice the diameter of the coin. No square roots or distributed multiplication. Double the diameter of the coin, and we're good to go. However, this has a benefit and a drawback. The benefit is that the grid is more compact (2*d vs ~3.4*d). This reduces your ability to "aim" for a grid edge or not. The drawback is that you will have to make more ambiguous judgment calls on whether or not the coin crosses an edge (75% of the time vs 50% in the previous approach). So, like the previous approach of getting 4 outcomes, we have a visual check. If the coin center lands anywhere in the white area of the following image, it won't cross an edge. 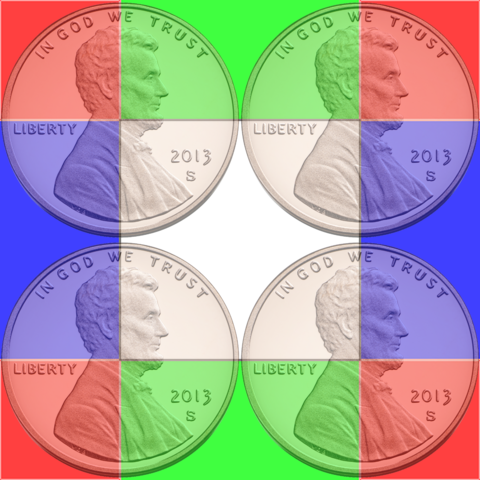 If the coin center lands anywhere in the green area, the coin will cross an x-axis edge. 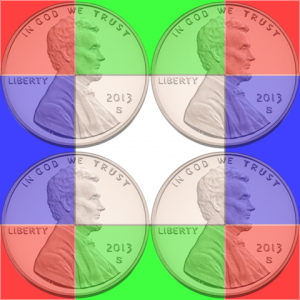 If the coin center lands anywhere in the blue, it will cross a y-axis edge, and if the coin center lands anywhere in the red, it will cross both an x-axis and y-axis edge simultaneously. As with the previous 4 outcome approach, we can convince ourselves this holds. The area of the white square should equal the are of the blue, as well as equal the area of green, as well as equal the area of the red. How do you like them apples? 8 equally likely outcomes from a single coin toss. 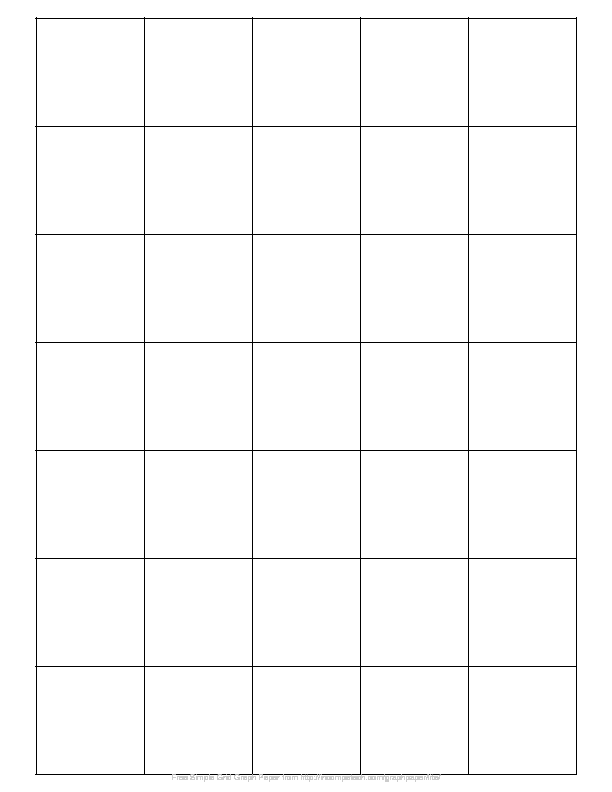 As mentioned, one big advantage, aside from getting 3-bits per coin toss, is the smaller grid printed on paper. You have a less opportunity to try to cheat the system, and influence the results, but you also may have a more difficult time deciding if the coin crossed a grid edge. 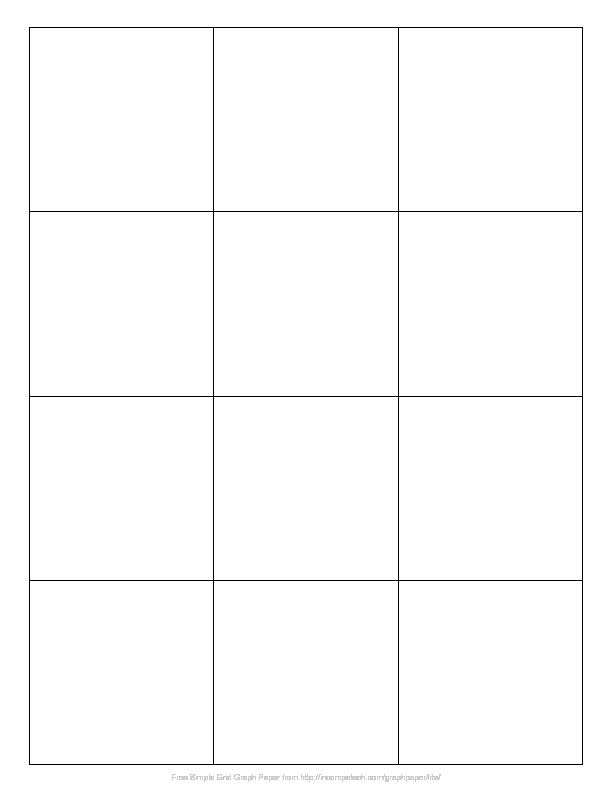 On the left is the paper grid used for 2-bit coin toss extraction, while the paper grid on the right is used for 3-bit coin toss extraction. Both fortunately and unfortunately, the coin will bounce when it lands on the paper. If the bounce causes the coin to ounce off the paper, all you can record is a single bit, or one of two outcomes- heads or tails, because it becomes ambiguous on whether or not the coin would have crossed a grid edge, and which edge it would have crossed. You could probably minimize the bouncing by putting the paper on something less hard than a table, such as a felt card table, a towel or rag, or even a carpeted floor. But this may also create unwanted bias in the result. For example, if the paper is placed on something too soft, such as a carpeted floor, when the coin hits the paper, it could create damage to the paper, thus possibly influencing future flips, and as a result, introducing bias into the system. Surrounding the paper with "walls", such that the coin cannot pass the boundaries of the grid may work, but the coin bouncing off the walls will also impact the outcomes. It seems clear that the walls would need to be placed immediately against the outer edge of the grid to prevent from introducing any bias. This is hardly conclusive on extracting extra randomness from a coin flip. It is known that coins precess when flying through the air, and as part of that precess, the coin may be spinning like a wheel. Which means that the coin could be "facing north" or "facing south" in addition to heads or tails. However, it's not clear to me how much spin exists in a standard flip, and if this could be a reliable source of randomness. Further, in our 8-outcome approach, we used the center of the coin as the basis for our extra 2 bits, in addition to heads and tails. 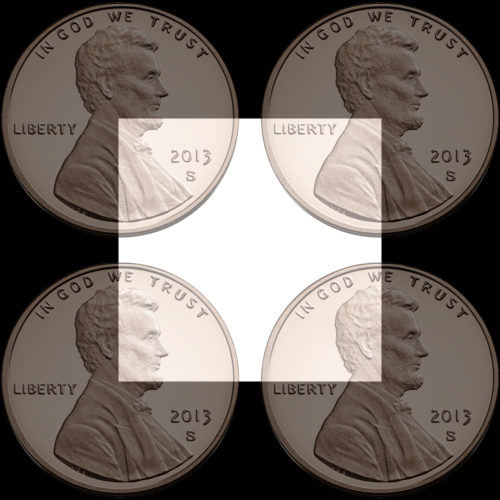 However, we could have made the grid edge length "4d" instead of "2d", and ignored the toss if the coin crosses both edges. This means a larger grid, which could improve your chances of aiming the coin in an attempt to skew the results, and also means sticking with smaller coins, as larger coins just won't have many grids that can fit on a paper. Other ideas could be adding color to each grid. So not only do we identify edge crossing, but use color as a third dimension to get up to 4-bits of randomness. So maybe the x-axes have alternating black and white areas, as do the y-axis, and the corners. The center of the grid could be possibly alternating red/blue quadrants. Where the center of the coin lands determines the extracted bits. Of course, this would be a visually busy, and possibly confusing paper. None of these have been investigated, but I think each could be interesting approaches to how to extract more bits out of a coin toss. I think this is a refreshing approach to an age-old problem- the coin toss. Extracting 3-bits from a single flip is extracting more entropy than a fair d6 die can produce (~2.5 bits). This means that practically speaking, the coin is more efficient at entropy extraction than dice. However, you can roll multiple dice simultaneously, where it's more difficult to toss multiple coins simultaneously. Thanks to Dr. Markku-Juhani O. Saarinen, Marsh Ray, and JV Roig for the discussions we had on Twitter, and for helping me flush out the ideas. Posted by Aaron Toponce on Friday, August 10, 2018, at 6:00 am. Filed under Cryptology, Personal, Security. Follow any responses to this post with its comments RSS feed. You can post a comment or trackback from your blog. For IM, Email or Microblogs, here is the Shortlink. You should that (in an appropriate mathematical sense) most of probability theory can be constructed using sequences of coin tosses. More precisely, the most commonly used stochastic processes can be defined on a probability space that is "isomorphic" to the space of countably many coin tosses. In some sense, coin tosses aren't limiting at all!